"EDward" (Real Name: Edward Abgaryan) is an Armenian League of Legends player, currently an Assistant Coach for Rogue. 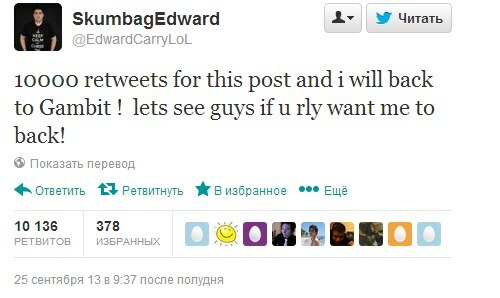 Edward is an Armenian League of Legends, currently living in the Russian city of Omsk, where he lives with his parents and older brother, who happens to be a League of Legends player. as well. He has been playing LoL since the North American Open Beta. He started his career with against All authority and various Russian teams before meeting Alex Ich, who recruited Edward to his team at the time, Team Empire. After joining Empire, Edward recruited his friend Diamondprox to the team, beginning the story of the legendary line-up, deemed as one of the best in European League of Legends history. October~, joins Team Empire as GoSu Pepper. January 14th, joins Gambit Gaming, renames to EDward. June 4th, leaves the team. November 7th, rejoins Gambit Gaming. November 13th, leaves the team. January 5th, joins Team ROCCAT. April 25th, leaves the team. May 7th, joins Vega Squadron, replaces WildHeart. June 5th, joins Gambit Esports. November 7th, leaves the team. November 24th, joins Rogue as assistant coach. This page was last edited on December 25, 2018, at 06:48.